Ask any native of Wilmington, California, for directions, and you’ll get a quick glimpse of what daily reality is like here. “I live on the side of town where Phillips 66 is, or where the Tesoro refinery is. Or where the container yards are; the side of town with the ports,” says resident Sylvia Arredondo, rattling off the various ways a local might tell you how to get to his or her house. This 10-square-mile South Los Angeles community, population 50,000, has the dubious distinction of having some of the worst air quality in a city that already has the country’s worst ozone levels, according to the Environmental Protection Agency. In addition to its proximity to three oil refineries and hundreds of active oil wells, it’s penned in by three freeways and the Port of Los Angeles — the nation’s largest. Thousands of diesel rigs rumble through the residential neighborhoods. 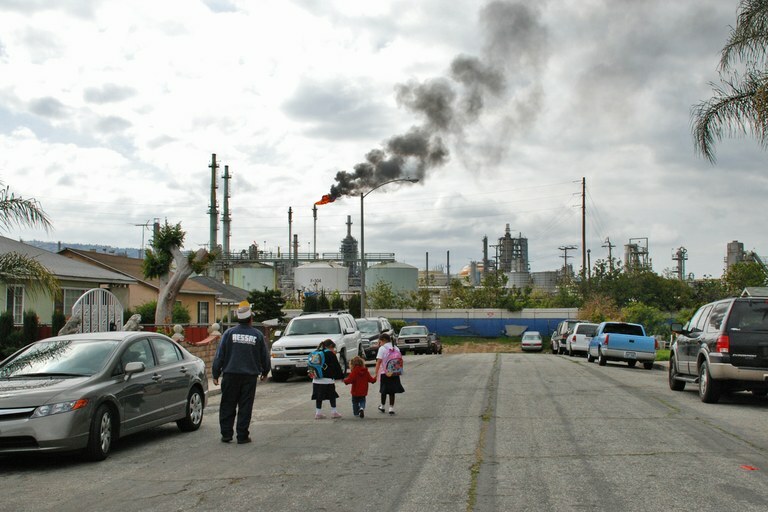 Children walk through the neighborhood of Wilmington, California, near a Conoco Phillips oil refinery. Arredondo is at the helm of a growing movement made up mostly of women of color who grew up here but left to get an education, and then later returned to battle the industries that are poisoning their families. Their fight is a legal and political challenge to oil companies and local air-quality regulatory bodies. But it’s also an exercise in civic engagement, one that even Wilmington’s older generations have joined, despite their fear of being deported or losing their jobs at the local oil facilities. “Before that class, I didn’t know what environmental justice was,” Arredondo said. Now she fights for it as the civic engagement coordinator for the nonprofit Communities for a Better Environment, and as the president of Wilmington’s neighborhood council. On a recent evening, Arredondo drove along tree-lined streets of modest homes and apartments, pointing out important places from her youth, like the dirt field she grew up playing in, next to an oil derrick. Nearby train tracks still deliver cars filled with crude oil — “bomb trains,” she dubbed them, due to their combustible cargo. When she pulled up to her childhood home, where her parents still live, two of her young nieces bounced down the front lawn to greet her. The 5-year-old uses two different inhalers because of breathing problems. When she was a kid, Arredondo couldn’t see the downtown LA skyline, just 20 miles away, because of the smog. That’s changed for the better thanks to stricter emission rules. But the last two years have marked a return to higher ozone levels, due to higher temperatures caused by climate change, or too-lax restrictions on vehicle and industry emissions — or both. A 2013 California state cap-and-trade law offered incentives for big polluters to become greener. But one study suggests that the program has inadvertently made air quality worse in places close to refineries and power plants, like Wilmington. Here’s how it works: Under the law, big polluters like oil refineries and power plants must buy permits that allow them to emit greenhouse gases. The number of permits available is reduced year by year, in an effort to gradually bring down the state’s overall carbon emissions. But rather than lower their emissions to meet the program’s targets, oil companies like Tesoro, which operates in Wilmington, choose to buy up other companies’ allowances, or pay to offset the damage they cause elsewhere, by planting trees in Alaska, for example. This gives them free license to continue polluting in their immediate areas. On a state scale that ranks vulnerability to air pollution from 1 to 100, Wilmington is around 96. The scale takes into account factors like poverty (the majority of local families make between $20,000 and $40,000 a year) and education (only 5 percent of locals have a college degree). In Wilmington, 86 percent of residents are Latino, and almost half are foreign-born. Last year, Communities for a Better Environment sued the Southern California Air Quality Management District, the body that monitors air quality in the LA area, over an environmental impact report that gave a green light to a merger between gas plants in Wilmington and the nearby city of Carson, creating the largest refinery on the West Coast. The regulatory body said that the merger would reduce air pollution by phasing out one of the toxic processes at the Wilmington refinery. But activists complained that it failed to analyze the impacts of an increase in volatile crude oil shipments to the plant. Back in 2015, Communities for a Better Environment was part of a group that blamed the City of Los Angeles for exposing black and Latino residents to health and safety risks related to oil exploration. In response, last summer, the Los Angeles city council held a hearing on a rule that would require drilling to occur farther away from residential areas, schools and public parks. At present, some wells are within 1,500 feet of schools and homes, but activists would like them to retreat another 1,000 feet. Industry leaders challenged this at a city hearing last summer, with one of the local refinery workers claiming such legislation would cost more than 100,000 jobs and reduce tax revenue and corporate donations. “A world without oil is not an option,” he said. In Wilmington, oil companies start their PR push early. Twenty-four-year-old activist Ashley Hernández remembers getting free backpacks and pencils with oil company logos as a kid. “You get popcorn from them every Halloween,” she said. For more than six decades, Phillips 66 has co-opted that holiday, painting one of its 3-million-gallon gas storage tanks orange to create an enormous grinning jack-o-lantern — “Smilin’Jack” — that towers over the community. Employees in bright yellow safety vests stand beneath chemical tanks and smokestacks, giving local families bags of caramel corn and plastic balls marked with the Phillips 66 logo. “They do community events, they’ll fund carnivals, they’ll do youth trips. They do it with an aim to silence them,” said Hernández, noting the hold that local industries have over her working-class parents, originally from El Salvador. After decades spent making a life in Wilmington, Hernández and her family would find it hard to just leave. “It’s home,” said Uduak-Joe Ntuk, Los Angeles’ petroleum administrator, a go-between on oil issues for business, government and citizens. As a petroleum engineer, he has industry ties, but as a resident, he’s also suffered health issues. “I grew up in LA with asthma as a kid, I have children that have asthma.” Ntuk said. 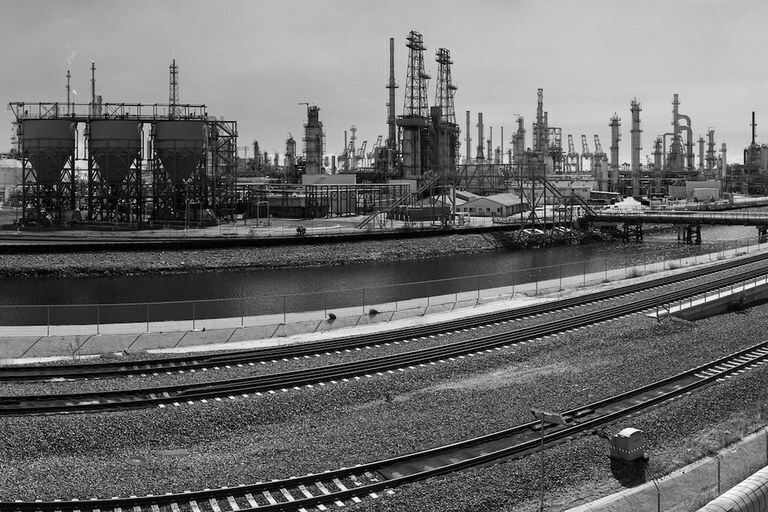 An oil refinery in Wilmington, California. A few women shared their contact information, including Maria Alvarez, a 53-year-old grandmother whose asthma flares up whenever she heads out on the street. “I shut myself inside most of the time so the pollution can’t get to me as easily,” Alvarez explained. Note: This article has been updated to correct Sylvia Arredondo’s affiliation with Communities for a Better Environment. She is the civic engagement coordinator, not its founder. Jesse Hardman is a public radio reporter, writer and videographer based in Los Angeles.